Understanding Equine Gastric Ulcers | SynNutra, Inc.
Equine Gastric Ulcer Syndrome is a common ailment of horses, causing discomfort, colic and poor performance. An estimated 60-90% of performance horses are afflicted, with racehorses being the most affected. The various equine industries spend millions of dollars each year attempting to treat and manage equine gastric ulcers. This article attempts to give the reader an understanding of how gastric ulcers develop and how the available treatment methods work. A better understanding will help one effectively prevent, manage and treat equine gastric ulcers. There is a great deal of misinformation written about equine gastric ulcers, its causes and treatments. Understanding the causes (the interaction of environmental and physiological processes) and the potential treatments will help you manage ulcers in your horse. The healthy horse’s stomach constantly produces hydrochloric acid during daylight as part of the normal digestive process. The lining of the stomach is coated with mucus that is produced by the gastric mucosal epithelium. 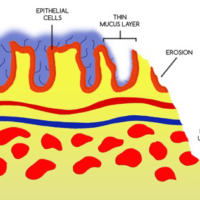 This mucus layer protects the gastric epithelium from acid damage (Fig. 1). Multiple mechanisms are responsible for acid and mucus production, but histamine is an important stimulus for acid secretion and prostaglandins (PG) stimulate mucus production. This image demonstrates the effects of stress and nSAIDS on the gastric mucosa. Loss of the mucus layer results in a gastric ulcer. A healthy mucus layer protects the underlying gastric epithelium from the hydrochloric acid produced in the stomach. Reduced mucus production causes erosions and the formation of deep ulcers. Horses are grazing animals and eat throughout the day, continuously producing acid. However, most performance and pleasure horses are stall-confined with long intervals between feedings. During times of feed restriction the stomach contents actually become more acidic. As long as the mucus layer is intact, the epithelium lining of the stomach is protected. The risk for gastric ulcer development exists when the mucus layer is compromised, typically by stress and/or medication. Since PGs are important signals for mucus production, anything that suppresses PG production suppresses mucus production. PG production is inhibited by NSAIDs (phenylbutazone, flunixin, ketoprofen, etc.) and, even more importantly, stress. In racehorses and other performance horses, the stress of training and competition is the most important factor leading to equine gastric ulcers. When the mucus layer thins and does not thoroughly coat the stomach lining, the epithelium is damaged by the strong acid in the stomach. When the epithelial layer is breached a gastric ulcer is formed (Fig. 1). Diagnosis of Equine Gastric Ulcer Syndrome is often made based on clinical signs and response to treatment. Since gastric ulcers are so common, a tentative diagnosis is frequently made for any horse with poor appetite and weight loss, among other signs. Although practical and usually accurate, endoscopic examination is necessary for a definitive diagnosis (Fig. 2). Horse stomach with healthy mucosa, no ulcers. Horse stomach with severe gastric ulcers. Endoscopic images of a horses stomach. The image on the left is normal with no signs of gastric ulcers. The image on the right demonstrates severe gastric ulcers. H2 Blockers (histamine blockers): Including cimetidine (Tagamet), ranitidine (Zantac) among others. Remember, histamine stimulates stomach acid production. There are limitations with the acid-reducing approach to gastric ulcer treatment. Lowering acid concentration (raising pH) in the stomach is effective in reducing ulcer-related pain. However, it does not stimulate healing. Furthermore, these medications need to be repeated during the day to maintain a restriction on acid production. Omeprazone (the most potent proton pump inhibitor currently approved for horses) is labeled for single daily dosing. Additionally, the chronic reduction of acid production in the stomach raises the pH and reduces nutrient absorption. The most notable gastric ulcer coating agent is sucralfate. Sucralfate (CarafateTM) adheres to the exposed sub-epithelial tissue forming a barrier similar to the mucus layer. Sucralfate is minimally effective, but, again does not stimulate the gastric ulcers to heal. The latest method in equine gastric ulcer management in horses is to promote epithelial healing. GastroMendTM is a triterpenoid-rich blend of natural ingredients and endogenous nutrients that promotes gastric ulcer healing by increasing collagen and fibronectin production. Collagen and fibronectin are both critically important components of the extracellular matrix (ECM) and the basement membrane that allows epithelial migration. Fibronectin is a multifunctional ECM protein that plays an important role in cell proliferation, adhesion, and migration, all components of the healing process. It is also found in the mucosal epithelial basement membrane. Needless to say, the interaction of signals in the gastric ulcer healing process is complex. In essence, fibronectin and collagen, together, are potent promoters of gastric epithelial rejuvenation. Used alone or in conjunction with low-dose acid inhibitors, GastroMend(TM) dramatically improves appetite and, in a short period of time, gastric ulcers most often completely resolve.. This unique patent-pending approach promotes gastric epithelium healing and re-establishment of the mucus layer of the stomach. The pain-free stomach can function in the presence of normal acid production. This means improved appetite and maximum nutrient absorption. Equine gastric ulcer syndrome has long been a significant and costly problem for horses and owners. Even so, equine gastric ulcers often go undiagnosed and are usually under-treated. Stress and the overuse of NSAIDs are the major causes, with stress being the most important. Traditional drug therapy for equine gastric ulcers is expensive and only partially effective. However, newer methods that promote gastric ulcer healing are not only highly effective, they are also surprisingly affordable.